Moments. A concept that is rapidly gaining traction in the mobile world, and is becoming a buzzword in many new products and startups. But why are moments so important to win the mobile race? With the introduction of the smart-phone, the digital journey completely changed. Information is available with a simple tap, and increasingly pushed with a notification. Being a device with little screen real-estate and designed for people on-the-go we don’t plan our user journey on a smart phone, as we did on a desktop. Instead smart phones allows us to act upon every impulse we have. Checking an email while running into a meeting, flipping through streams of pictures of a dress while in a traffic jam, or sending a tweet to support when waiting to leave our driveway. As a mobile user, our journey is no longer a sequential experience. It has become fractured in an endless stream of impulse-driven and fragmented moments. We literally live in the moment when we are on our smart-phones. As a consequence, every time we act on an impulse, our expectations are high and our patient is low. Being constantly connected has trained us to expect immediacy and relevance in moments of intent. Therefore, our tolerance for error has become very thin. More so, a bad experience will make us angry and frustrated. Yet, it is in these moments that a mobile user is very open for any influence that might satisfy its needs in a quick way. 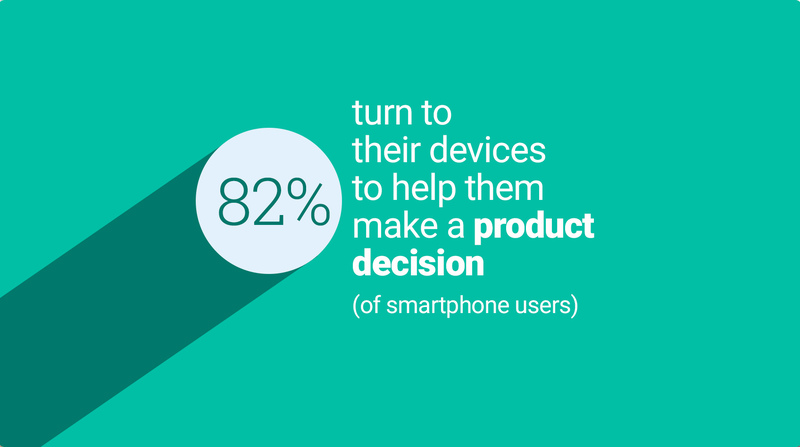 Research shows how 82% of people turn to their devices while being in a store to get informed about their buying decision. In fact, 60% of online consumers say they are making purchase decisions more quickly because of online research now compared to a few years ago, shows the May 2015 Google/Ipsos study. Being there in that moment-of-need should be the number one priority for marketeers and mobile product builders. For marketeers this means that understanding these moments are crucial for shaping the decision of a mobile user. 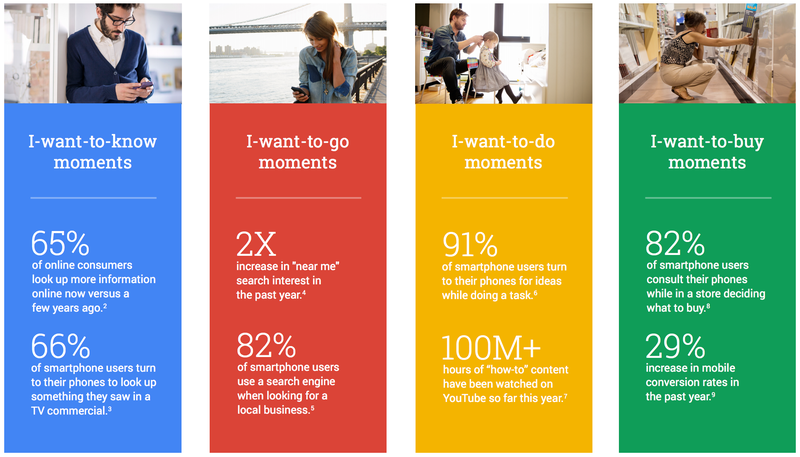 Google defined four moment types, which I feel are a great help in creating perspective. In essence, each moment is a brief situation where a user wants to get inspired. You most likely want to get inspired about stuff to do, places to go to, information to get better informed, and things to buy. Therefore, marketeers should stop trying to deliver ads, but should start to think how they can delivering inspiration. Startups, such as Kiip already pave the way but the industry as such still has a long way to go. With every moment being the start of a potential purchase, we find ourselves at the dawn of new mobile experiences. Surely we will continue to turn to our smartphones for getting on-demand inspiration. But a new mobile pattern will start to emerge. An experience where our smartphones will become capable of predicting our moments-in-need, turn themselves into a personal shopping assistants, personal coaches, or simply a friend that will be able to help us make the right decision. These are perfect moments. A moment so perfect, that it inspires and reaffirms the decision of the mobile user in a split second, hereby taking into account multiple layers of situational and behavioural intelligence for making such an intelligent and personalized recommendation. These perfect moments will allow marketeers and digital product builders to interact with their mobile users in a new and unprecedented ways, where it will seem as if the smartphone is a living and anticipatory device that serendipitously uncovers the best decision for that particular moment. But that future still is far away as various technologies still need to mature and find global market acceptance. Realtime contextual intelligence. Making big decisions on small screens, means the delivery must be at the right time and hyper relevant. Context awareness is a cornerstone in this play. The current situation and past behaviour of a user greatly influences a decision. With smartphone sensors and A.I finding an increasing acceptance by mobile users, a marketeer can tap into a continuous and realtime stream of ambient intelligence that lead to a better understanding and exploitation of a moment. Mobile payments. With the seamless mobile payment technologies maturing, already emerging payment systems shorten the path to a purchase in less than a few taps, or seconds. Easy and fast payment handling on mobile is key. Already Paymill, Stripe or Braintree are the go-to players and offer PCI compliant one-line integrations. Recommender systems. A next generation of recommender systems will need to upgrade their current practices of collaborative filtering and form hybrids where they start understanding contextual awareness in order to pre-render more relevant recommendations in anticipating a particular moment. Predictability. Understanding the impulse driven motivation of mobile users, removing the number of taps on the path to a purchase is a direct contribution to winning a sale. Being able to predict an ideal moment and pre-render purchase options so that a mobile user will only need to confirm a purchase will be a game-changer that will disrupt the advertising industry as well as become the catalyst for a brave new world in mCommerce. Personalized user experience design. Dealing with context-awareness, predictability and advanced levels of consumer intelligence requires a new way of delivering a user experience. Putting up clunky banners or interstitials on a small screen is for obvious reasons a big no-no. Let’s welcome a new generation of apps that remain dormant in the background, only to foreground when a hyper personalized experience can be delivered. Psychology. More than ever, a renewed interest in behavioural studies and consumer psychology should lead the way. As these new technologies require a first principle thinking, successful companies will understand how they should tap into the human behavioural processes in order to win the race to stay or become a top-of-mind brand. The winners of this race will be companies that will be able to address our needs at the right moment, using hyper personalized recommendations that inspire the user to turn its intention into a immediate purchase decision. ← AI. The new VC goldrush.